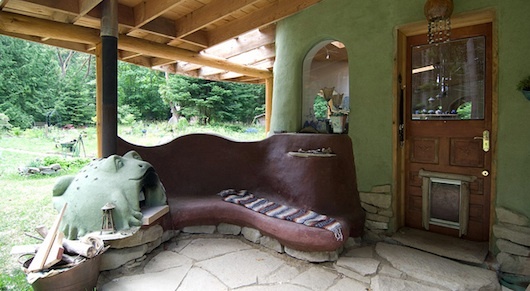 A cob bench is made with mud - usually a mix of earth, sand and straw to create thick walls which are hand sculpted. These kinds of houses can also be known as "earthen" homes which includes adobe and rammed earth. Cob construction has mostly died off but it's actually enjoying some kind of revival since the 1980's and I can see why. 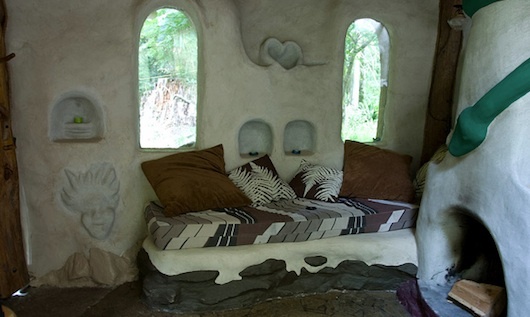 These homes are good for the environment, they are nontoxic, they're fun to build, and they're beautiful. This is the outdoor area (notice the cob oven) of a 1,200 square foot home. The one below is inside a 240 square foot house. In a cozy spot next to the fireplace. Don't forget to visit and bookmark our friends at Cob Works who's homes you are seeing right here. You can see and learn more at their website, Cob Works.